The Character Assassin : Marrying a psychopath, and how they portray you as the unstable perpetrator. Marrying a psychopath, and how they portray you as the unstable perpetrator. 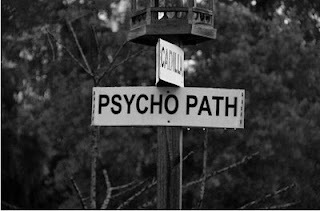 Sociopath, narcissist, psychopath... Whatever you want to call one. They have one similar quality.. They are capable of causing horrific pain and suffering. (mentally and physically) They simply could care less about the damage they cause. When normal people cause pain others pain, it is usually under the circumstance of being hurt, afraid or simply not having the tools to handle confrontation and pain appropriately. The difference in normal and psychopathic is; Normal individuals feel remorse for what they have done to hurt a person. The guilt will affect them so much, they have a hard time living a happy life. Psychopaths are able to keep thriving, the pain they know they have caused someone, doesn't bother them. They probably won't ever think about it again, unless the person they caused the pain to, expresses that they are hurt. This doesn't evoke guilt in the psychopath. Instead it evokes ANGER, irritation, and then the psychopath continues to cause more hurt, and damage. Psychopaths intentionally hurt others, without ever feeling any guilt. In fact, “guilt” is a foreign emotion to the psychopath. They do not know what guilt feels like because they have never felt it. Yet ‘guilt’ is used often by the psychopath to manipulate others. They are often able to get people to do what they want, by making the person feel guilty. From my own observations, guilt is one of the psychopaths favorite tools to use against an empathic, caring person. Especially when it comes to children. Having children with a person with psychopathic tendencies is a living hell. It is almost impossible to ever live a happy life when you share children with a psychopath. They will never leave you alone, they will use the children to manipulate and use you. The psychopath pretends to be a caring parent who Loves their children, but the truth is, the psychopath is not capable of Love. They are only capable of Hate. And unfortunately the psychopath HATES their EX more than they LOVE their children. Even when the children are of adult age, the psychopath will still find a reason to torment you. People who marry psychopaths, do not marry them knowing they are psychopathic. They were lied to and manipulated to believe the person was genuine and caring. But the person soon learns that person they married is not a good person. Some people will live in deniall, because accepting that you have married a monster is a hard pill to swallow. The marriage never last, but the abuse and trauma from the marriage does.. The psychopath becomes bored with their spouse/victim, because they have nothing more to offer the psychopath. So the psychopath simply moves on to their next victim, of course not before slandering, spreading lies, and accusing the victim of horrific acts against them. They do this to protect themselves against what the victim may say about the relationship. By bashing the victim first (before the relationship is even over) the psychopath is making sure their 'story' is heard before the victims. This makes the victims story look false. After all the psychopath has already warned others that their soon to be ex, would probably try to accuse them of abuse or cheating, to simply get revenge because they didn't want to be in a relationship with such a unstable person who has deep mental problems. thank you so much for this post!My psychopath husband Christopher Garcia(2 months separated now)always begged me to have a baby with him.he has 3 other baby mamma that he never married,and he has never been a stable father to any of the 4 children.I always refused and just knew something wasn't right,(what 41 year old man wants to have another baby with his new wife,after not being there for all the others,one of which isn't even 5 yet!? )after 3 years of lies and cheating and putting the pieces together, I'm so thankful to God that I trusted my instincts. All that child would have been to him is another tool to control me,and make me feel like an unwanted desperate single mom(which is how he tries to make his ex's feel).it Breaks my heart still.there are no words to describe the moment when you accept the person you love the most in the world never could love you back.stay strong and never doubt your instincts.the more you compromise who you are the less they value you...if that's even possible.he still stalks me daily, telling me,"even when you divorce me i will always consider you MY wife!"lol. At least he can't use a child as leverage,just to abandon them eventually like the others. I agree with you. They are truly just soulless beings living among us. They will stop at nothing to destroy you and reputation, try to turn others against you, and make you look "unstable". All you can do is NOT REACT! And that's hard to not do. A normal human being reacts when they are being unfairly attacked. But the sociopath is anticipating your "reaction" so they can make you look crazy and then say to everyone "I told you she/he was mentally unstable, look at the way she/he is acting". It's all part of their plan to destroy you. As hard as it may be ,,,, you must not react, you must ignore all attacks against u by the sociopath. It will be hard, but once they see that you will not react and you don't seem to care anymore, they will think they accomplished their goal and they will stop and move on to their next victim. This is what they do, over and over again. My advice would be to take a break from social media, because that is where they carry out most of their attacks. Block them from any social media you are on. And never talk to them ever again. Change number, do what you must in order to never see them or hear from them again. Unfortunately I can't tell you it ever stops. Sometimes they will find another person who distracts them for a while and they leave you alone. But having children with one is another story. They will target other people, but in the back of their twisted brain they will always remember they have children. If those children have been taken away from them, it can become an obsession to them to get them back. And they may have the delusional mindset that they deserve to have them back. Sociopaths want to WIN. that is all they want. A violent sociopath is very scary. I feel for your situation. You were lured in by a very good actor and manipulated and your intentions were nothing but good. While your exes were the opposite. Does your ex routinely abuse drugs and alcohol? Sometimes people who regularly do drugs and alcohol only act out when really messed up, and they can act so horribly on those substances , they may seem like a psychopath. But sober they are not bad people. I have seen substance abusers do horrific things because of certain drugs. When they finally did get sober, it was like night and day. It was the drugs that brought out the demon in them. And if your ex does horrible things when on drugs or alcohol, that does not excuse their behavior, and you should stay away from them. And it is still YOUR decision if when he gets sober you want to have any contact with him. He has put you thru hell, and you do not have to deal with him ever again if you choose. This is all very interesting reading and, yes, you are correct it is amazing how much destruction one person can cause. I would offer my sympathy to those whom have commented but, I cant because I don't feel it. However I do feel that some of you may have it all wrong. Some people are just nasty for the sake of being nasty but they mask it very well. They may even feel terrible for what they have done. Personally I find being a Sociopath liberating. Imagine for a second not having to deal with these useless emotions that cause nothing but hurt. Being able to achieve everything I want via manipulation of those around me is nothing short of awesome. By now you are probably thinking how can I say these things. Well, I would try and explain it to you but normal people are incapable of understanding the way I think let alone feel. I might also add that being Cluster B (Google that if you have to) is often no joy ride. We do have fleeting moments of coherent normality, where, we despise what we are....Monster's! But hey, what are you going to do about it? Ill tell you...Nothing. Unfortunately for you there are some of us whom are what if called High Functioning Sociopath's You will never identify us until you are looking up from the bottom of what is left of your life. Trust me, I know,....now, who's next? See and your comment explains you exactly. Threats... Saying you know who's next... What is that suppose to even mean? You are choosing your next victim. Normal, healthy and loving people do not pick out human beings to victimize. Kind, caring and stable people do not see humans as something to be used for their own sick gain. Sean regan - your are not a high functioning sociopath. Just a troll who has nothing better to do but troll blogs of people who you think of as weak and bully them. I'm sure in real life you are just a scared, insecure little person that can't get anyone's respect. And that is sad for you. But instead of working to earn respect from your peers, you have given up. And the only way you can feel better about your lack of confidence and respect from others. You can get online and find people who u seem "weak". But this blog is for people who are strong survivors of vicious sub-humans. So it is pretty hard to scare any of us, because we have experienced personal hell and evil. And we are still HERE AND ABLE TO TALK ABOUT IT. We are survivors and have a voice. You don't have to be this online persona that you feel will strike your fragile ego. For the victim of one it is Not so liberating... It is debilitating and a true journey thru hell.